We all know that getting up can be the hardest thing to do in the morning, and the last thing that you’d want to hear is the sound of an annoying alarm clock. Even if you hate alarm clocks, the Divoom Timebox may be the one thing that can help you wake up on the right side of the bed. This awesome gadget is just like a normal alarm clock but you can use a free mobile app on your phone to customize the clock however you want. 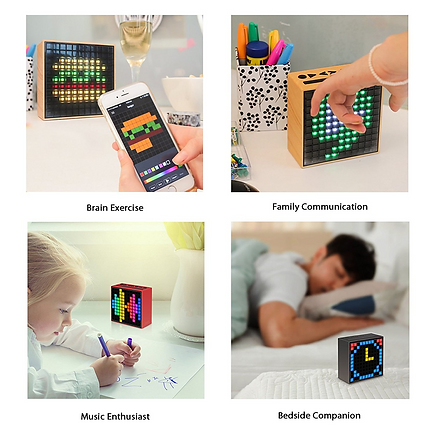 The coolest thing about this alarm clock is that it has LED colored lights which light up with fun pictures that you can make using the Timebox app. All you need to do is buy the clock and download the Tivoom app onto your smartphone. 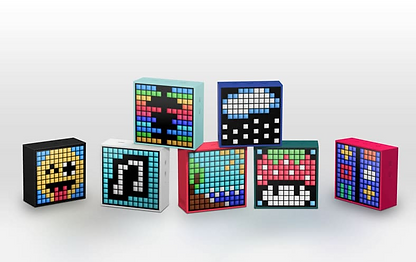 Once you have them both, you can use the app to customize your own pixel art that that will mirror onto your Timebox. You can even set up the clock to light up whenever you get notifications on your phone. You can use Timebox to listen to your favorite radio stations or chat with your friends whenever you want by using its hands-free calling feature. You can set alarms and use its sleep timer. And you can even check the temperature and play minigames. Unfortunately the Divoom Timebox doesn’t come at a cheap price. It’s currently priced around $60 on Amazon but the app is completely free to download. It’s a very cool and innovative gadget that can be a fun addition to your room if you’re willing to splurge a bit for a cool clock.